The Double Seventh Festival known in China as Chinese Valentine's Day, falls on the 7th day of the 7th lunar month. Also callded "Qi Xi Jie" or "Qi Qiao Jie", it is a traditional festival full of romance and important to ancient ladies, but not as well-known as other traditional festivals. But, almost all Chinese people know the legendary origin about the festival. Long time ago, there was a poor cowherd, Niulang. His parents died and he lived with his elder brother and sister-in-law, who were both mean and treat Niulang badly. They kicked Niulang out of the house and left him old clothes and an old ox. Niulang built a cottage at the foot of mountain and took good care of that old ox. 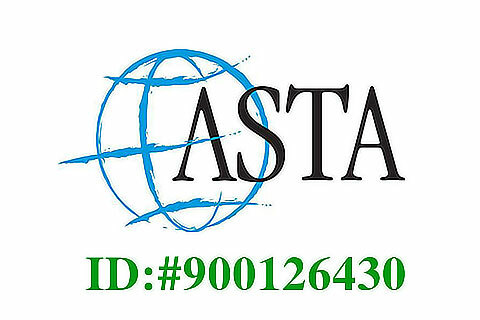 One day the ox spoke to him and told that it used to be Taurus, a proud star in the night sky but was published due to his violation to law of the Heavenly Palace. The old ox told Niulang some goodness would come to the pond not far away from his cottage for having a bathe; Zhinu was among them, who is daughter of king in Heaven, the kind and the most beautiful; If he could take her clothes away, she would left and become his wife. Niulang listened to the old ox, and went to the pond at appointed day. When the goddness came and took off their silk ropes then jumped into the water. Niulang found Zhinu's clothes and hide away. Other goddesses witnessed Niulang and dressed up quickly and flew away, only Zhinu left. He had adored her from the first moment he saw her. They looked into each other's eyes. The heavenly girl told the poor cowherd that she would be his wife. They soon got married lived together in that cottage. Niulang worked hard to grow crops and Zhinv raised silkworms. They lived a simple but happy life, with a little boy and girl Zhinu give birth afterwards. One day the old ox died and they preserve the its hide according to its words left. At the same time, the king and queen of the heaven found that Zhinu married a man and had babies. The queen flew down to earth with her solders and caught Zhinu away. Niulang came back home and found Zhinu not at home, only the children left. The babies cried and told him where Zhinu was going. Niulang remembered what the old ox told him and placed the twins in wicker baskets on a pole to carry on his shoulder, put on the magic hide, and flew up, up into the sky. The queen noticed that Niulang was following them, she became angry, with wave of her arm, and a raging torrent immediately appeared between her group and Niulang. He could not get past this wide swollen river. Heartbroken, Niulang and his children could only look and weep bitterly. 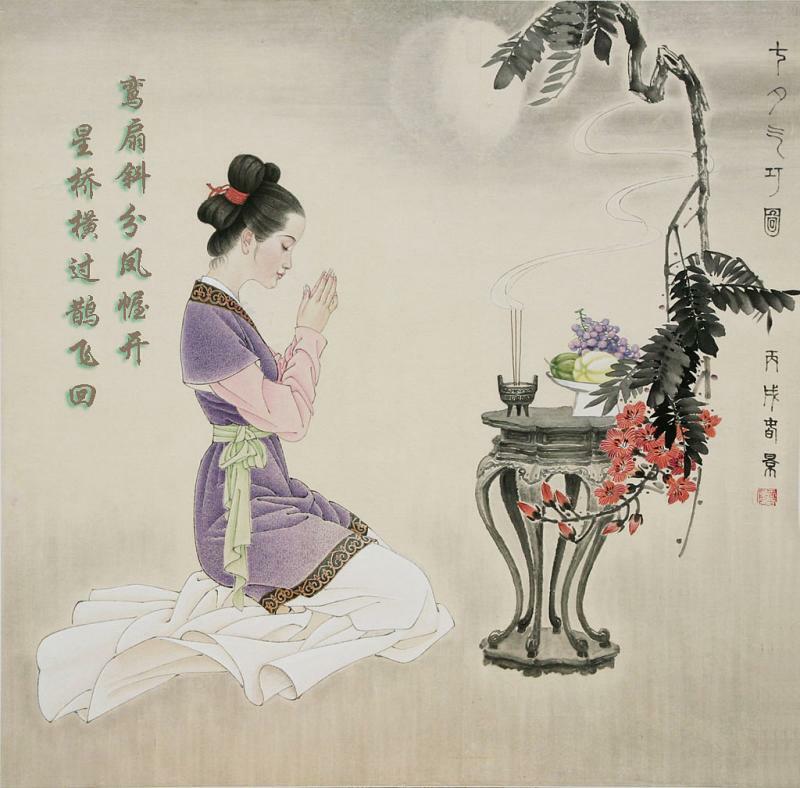 The King in his Heavenly Palace was moved by the sound of their crying, and decided to allow Niulang and Zhinu to meet once a year on the seventh day of the seventh lunar month. 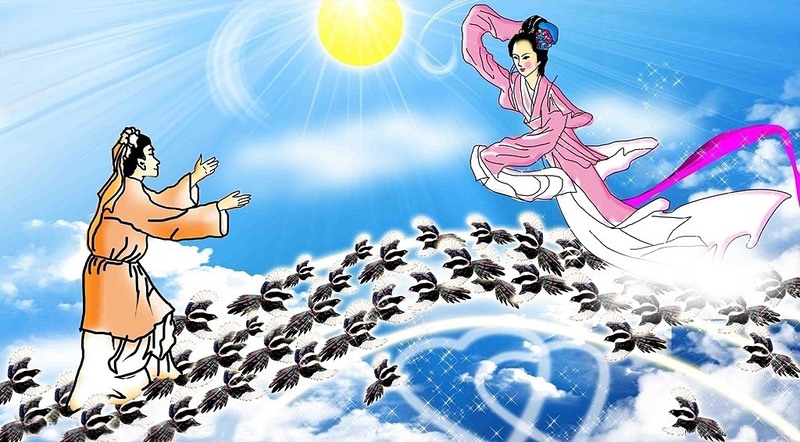 This sad love story was passed down from ancient times, with little magpies were seen on double seventh day, as most of them fly to Milky River to form a bridge for the annual meeting of Niulang and Zhinu. In ancient times, the double seventh day was an important festival for young women and young girls. No matter poor or rich, they would put on their best clothes and place an incense burner in the courtyard and lay out some fruit as offerings. Then all the girls in the family would kowtow to Niulang and Zhinu and pray for ingenuity. But nowadays, these traditional customs were lost and most Chinese young people favored Western Valentine's Day, a great day to express love between lovers.